Mercedes-Benz SLR McLaren perfectly connects the heritage of legendary racing cars SLR from the 50’s with up-to-date technology of modern racing monoposts of McLaren-Mercedes. Four years after the introduction of one of the today’s most powerful cars, Mercedes scores once again. The killer of Ferrari and Porsche as this car is often called has now a stylish removable roof and Roadster surname. The coupe was also one of the pioneers in application of sporting technology into our streets. Its developers used a lot of carbon fibers that are heavily used in racing because of their incredible durability and low weight. This carbon fiber technology was in case of the new roadster used even more, especially in construction of monocock’s chassis that is now extremely agile and durable against torsion forces even if the car hasn’t a solid roof. It provides nice safety thanks to its surprisingly high absorption ability. Uniqueness of the roadster is hidden in the roof of course. In this case we can find a sophisticated system that can elegantly „uninstall“ the roof and hide it under cover panels without any negative effect on beautiful lines of the car. This semi-automatic system requires only manual release from the front window. The rest is all automatic and electro-hydraulic mechanism needs only 10 seconds. Safety deficit of open body is compensated with steel-reinforced A-pillars and two fixed roll-over bars behind the seats. 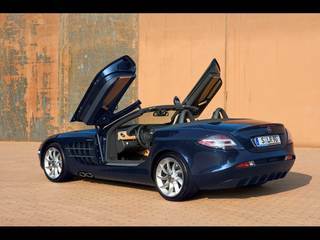 The SLR Roadster has a brand-new roof material that protects its passengers against bad weather, but it’s also very flexible and aerodynamic stabile. The owner can enjoy its high output aggregate without any compromises also in case of the top speed 332kmph what’s comparable with the coupe version. This all is a result of many hours spent in a wind tunnel, where designers found the best mix of design, safety and usefulness. Now you can enjoy ride without any acoustic or performance distractions. Heart of the roaster is same as we can find in the coupe. It’s a supercharged V8 engine behind the front axle with 5.5 litres of volume. The engine produces 460kW (626hp) at 6500rpm. Massive 780Nm of torque is available just at 3250rpm and remains practically unchanged till 5000rpm. With three valves per cylinder and 5-speed AMG automatic transmission Speedshift R it needs only 3.8 seconds to beat 100kmph. The new Mercedes-Benz SLR Roadster is like its older brother produced in McLaren’s factory in English Woking where they built also F1 monoposts. This model is available in exclusive distribution chain since September 2007. 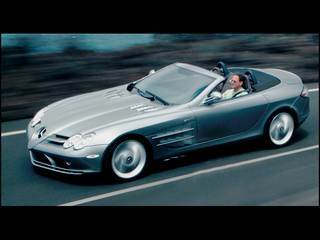 Wallpaper "Mercedes-Benz SLR McLaren Roadster"
What is your opinion about Mercedes-Benz SLR McLaren Roadster?